09 Nisan 2018 tarihinde yayınlandı. Find below the results from day two in Turkey. 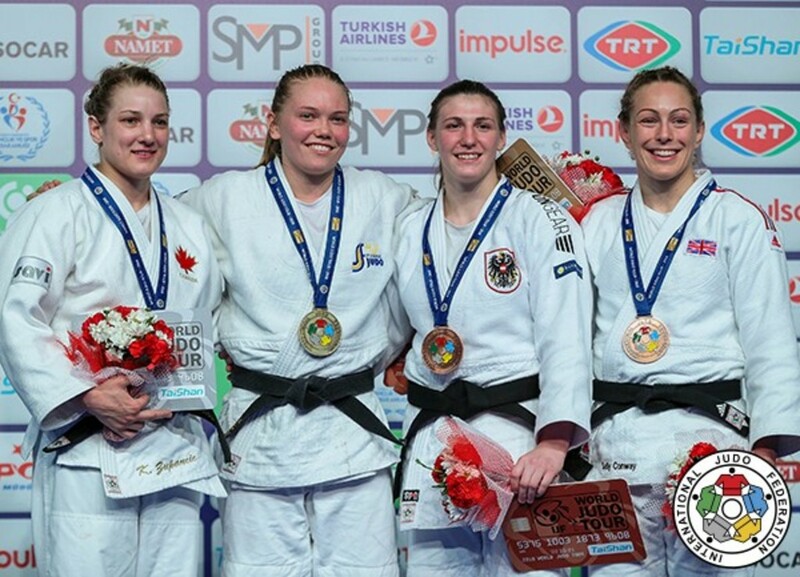 Tunis Grand Prix bronze medallist Magdalena KRSSAKOVA (AUT) made good on her top seed status as Austria’s number two in the -63kg weight category won her second Grand Prix title. World number five Kathrin UNTERWURZACHER (AUT) is Austria’s best-ranked judoka in the -63kg category and in her absence, KRSSAKOVA seized her opportunity to move up the rankings and close the gap to her teammate on the World Ranking List. World number 55 Valentina KOSTENKO (RUS) fell behind to a waza-ari from a uchi-mata-sukashi and world number 15 KRSSAKOVA countered her opponent for ippon with six seconds left on the clock. Both Austrian judoka will now be expected to receive the nod for the European Championships in April. In the first semi-final KRSSAKOVA held down Zagreb Grand Prix bronze medallist Mia HERMANSSON (SWE) with a tate-shiho-gatame to drive into the -63kg final. In the second semi-final KOSTENKO defeated two-time Grand Slam bronze medallist Busra KATIPOGLU (TUR) with an uchi-mata for a waza-ari score in added time. It took six minutes and nine seconds of golden score to find a winner as the Russian produced the first and only score of the contest to conclude the first session of judo on day two. The first bronze medal contest was won by KATIPOGLU who defeated Pan American Championships silver medallist Yanka PASCOALINO (BRA) for a momentous start to the final block for the hosts. 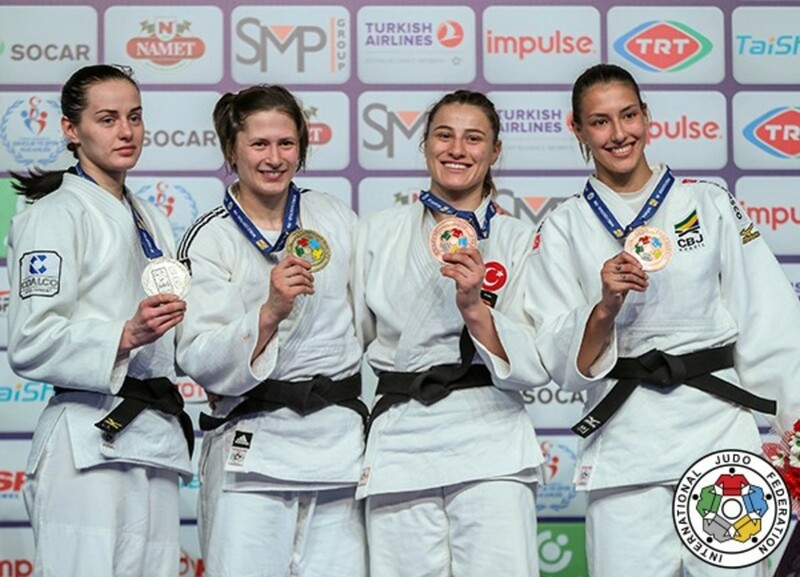 KATIPOGLU won bronze at home in style with two waza-ari scores with the pick of the two being her opener from a sode-tsurikomi-goshi. The Turkish judoka jumped into the arms of her father after leaving the tatami and cried with tears of joy after a rollercoaster of a ride in recent years with injuries. The second bronze medal was won by world number 146 Alexia CASTILHOS (BRA) who countered an uchi-mata from HERMANSSON to roll her opponent for a waza-ari. CASTILHOS won her first IJF World Judo Tour medal when her Swedish opponent repeated the same mistake and the Brazilian took full advantage for her second waza-ari score. Perseverance paid off for World Judo Masters bronze medallist Anna BERNHOLM (SWE) who finally won her first Grand Prix gold medal after seven years on the circuit. BERNHOLM prevailed against former world number one Kelita ZUPANCIC (CAN) to win gold at the 28th attempt. ZUPANCIC submitted to a juji-gatame after two minutes of golden score as the Swede showed the world that she means business in the -70kg category and will be a force to be reckoned with next month at the European Championships. The first bronze medal was awarded to 20-year-old Zagreb Grand Prix bronze medallist Michaela POLLERES (AUT) who bested MATNIYAZOVA. 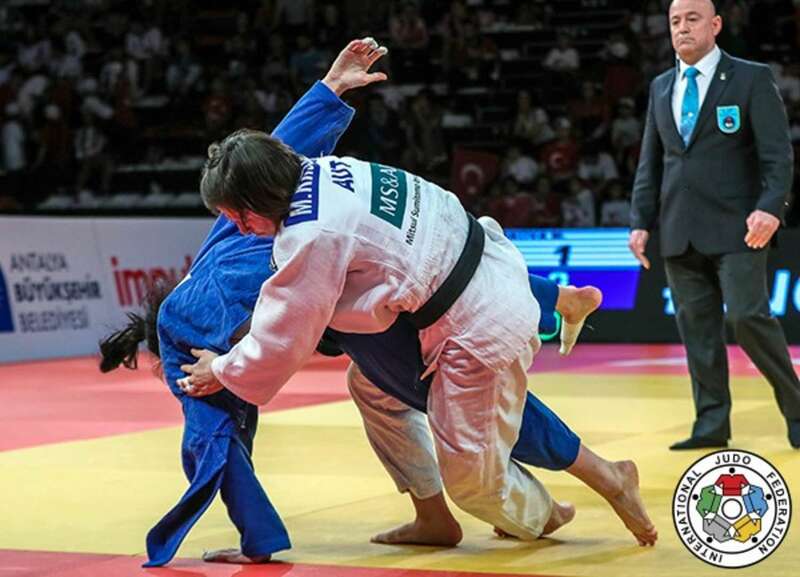 POLLERES threw her Uzbek rival with a ura-nage for a waza-ari score and followed up with osaekomi for 10 seconds and more silverware for Austria whose women’s program is among the best in Europe. The second bronze medal was won by Olympic bronze medallist and Paris Grand Slam winner Sally CONWAY (GBR) who showed her character to come from behind to beat GERCSAK. CONWAY trailed to a waza-ari from a cutting ashi-waza attack but responded with a tani-otoshi to level the score. Scottish judoka CONWAY submitted her Hungarian opponent with a juji-gatame with just one second left on the clock to return to form. World Judo Masers bronze medallist Tommy MACIAS (SWE) was the best performer in the -73kg category on Saturday as he won all four of his contests to reign for Sweden. MACIAS had won four Grand Prix medals before today (three silver, one bronze) and finally achieved that elusive Grand Prix gold on a rewarding day for the Swedish team. Double world bronze medallist AN Changrim (KOR) was a joy to watch in the preliminaries but may have been guilty of underestimating his Swedish foe who threw the South Korean with a sumi-gaeshi for ippon after only 50 seconds. A favourite losing decisively in the opening minute is exactly what judo is about. Anything can happen to any athlete at any time. In the first semi-final AN defeated World Judo Masters bronze medallist Hidayat HEYDAROV (AZE) by a waza-ari score in their first ever meeting. AN came out on top with a sumptuous o-guruma for the only score of the contest to take his place in the final. In the second semi-final MACIAS bested 20-year-old David LIMA (BRA) by a single waza-ari score from a yoko-tomoe-nage. The first bronze medal was won by world number 21 Mohammad MOHAMMADI (IRI) who defeated LIMA by a waza-ari score which was the only score in the four minute contest. 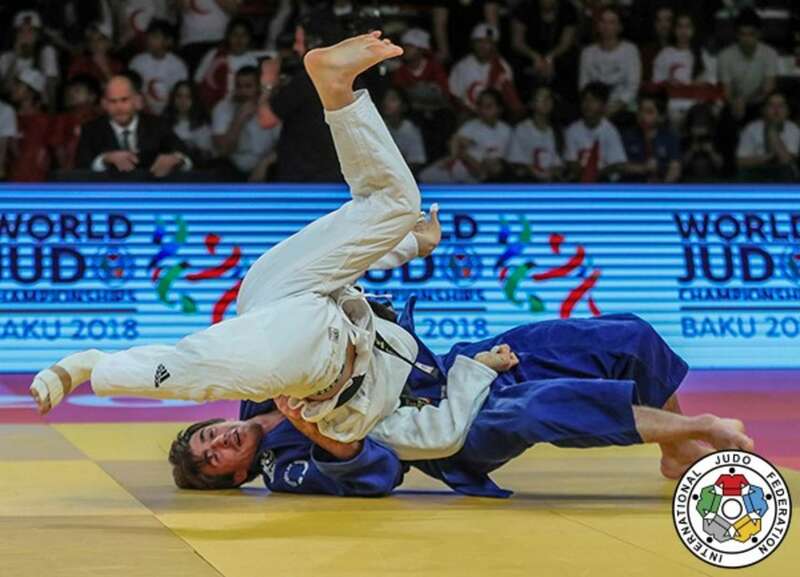 MOHAMMADI protected his advantage, which came from an osoto to osoto counter with a mature performance as 20-year-old gave a valiant effort in his first appearance in an IJF final block. The second bronze medal went to HEYDAROV who beat world number 166 Nikola GUSIC (MNE) by a waza-ari score. Azeri star HEYDAROV scored with a reverse seoi-nage and then adopted a more cautious approach which is uncharacteristic of the flamboyant Junior world champion as he was content to win by a single score after four minutes of action. Agadir Grand Prix winner Vedat ALBAYRAK (TUR) ended day two with Turkey’s first gold medal as he defeated first time IJF finalist and Zagreb Grand Prix bronze medallist Jack HATTON (USA) in the -81kg final. If ALBAYRAK looks familiar it is because he used to represent Greece under the name Roman MOUSTOPOULOS. 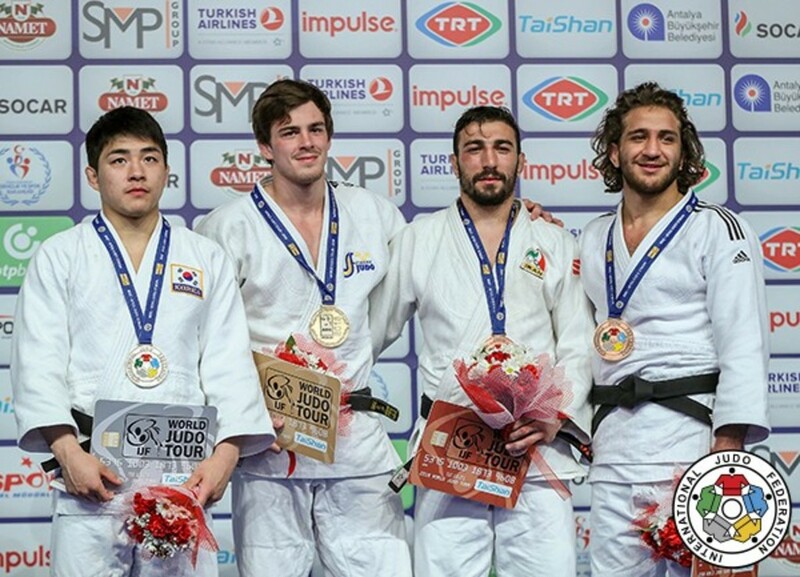 ALBAYRAK, 24, who was actually born as Vano REVAZISHVILI, has won three medals from three Grand Prix events for Turkey since officially switching nations in January. The world number 27 took silver in Tunis, gold in Agadir and now gold in his adopted homeland as he overpowered HATTON on the ground with a yoko-shiho-gatame hold. In the first semi-final 18-year-old Tato GRIGALASHVILI (GEO) lost out to ALBAYRAK after three minutes of golden score by ippon. GRIGALASHVILI attacked with a ko-soto-gake but the home judoka changed direction and took control of his opponent in mid-air for a sensational win in added time. In the second semi-final 21-year-old former Zagreb Grand Prix bronze medallist Sukhrob TURSUNOV (UZB) fell to HATTON by ippon from an ouchi-gari in golden score. The first bronze medal was won by u23 European Championships winner Dorin GOTONOAGA (MDA) who squeezed past TURSUNOV. GOTONOAGA won his second Grand Prix bronze medal by a waza-ari score from an osoto-makikomi as the Moldovan matched his result from the 2017 Düsseldorf Grand Prix. The second bronze medal went to GRIGALASHVILI who gave Hohhot Grand Prix bronze medallist CSOKNYAI Laszlo (HUN) a torrid time. 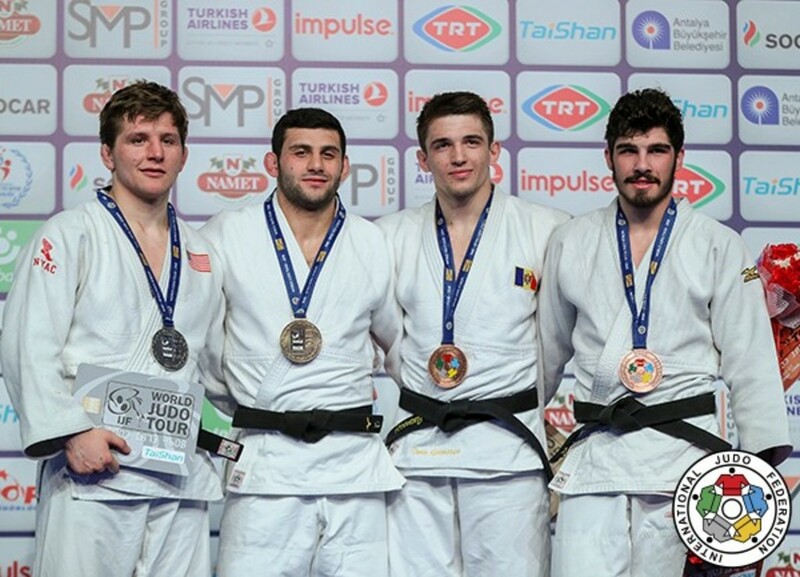 GRIGALASHVILI, 18, marked his first international competition on the IJF circuit with bronze as world number 20 CSOKNYAI struggled to contain the young Georgian. CSOKNYAI received his third shido with a minute and a half left on the clock and was disqualified.